The story of the secret love child from the tunnel… there were eleven babies, not ten, but the last one was German. 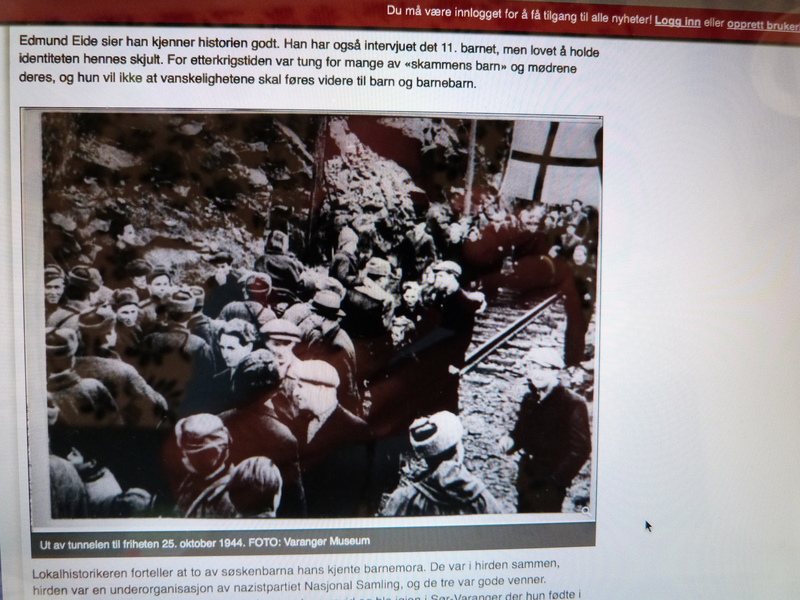 It’s one of the most famous stories in Norwegian wartime history: the ten babies born in the tunnels of an iron ore mine where 3,000 people sought refuge from the fighting as the Red Army liberated the town from the Nazis. In October 1944 more or less the entire population of the north Norwegian town of Kirkenes had fled as Red Army soldiers pushed the Nazi occupiers west back through Finnmark. Several thousand moved to the relative safety of the tunnels at the iron ore mine at Bjornevatn to get out of the firing line. For this past two weeks, the survivors of October 1944 and their families have been celebrating their liberation and toasting the ten babies brought into the world as Norway once again breathed the oxygen of freedom. Except now it’s emerged that there weren’t ten babies. There were ELEVEN. And the reason why this detail of history hasn’t been mentioned in the seven decades since the liberation of Kirkenes? Simple. The father was an Austrian, serving with the Nazis. The emergence of the 11th baby has added yet more controversy and self-examination to the difficult chapter of Norway’s war years, especially the treatment of those who fraternised with the occupying German forces, which were in fact, overwhelmingly Austrian mountain troops. As fate would have it, the 11th baby is a girl born on the very evening that Kirkenes was liberated by the Red Army, October 25th. She – and everyone around her – kept her identity secret at the time. It’s only now that her story has become public. Finnmark historian Edmund Eide knows the 11th baby. He was 12 at the time she was born and was in the tunnel at Bjornevatn with his parents and his five siblings. Red Army troops liberate the 3,000 people sheltering in the iron ore mine at Bjornevatn. In the post-war days the shame of having a child of the Germans was very great, Edmund says. The family promised to keep the girl’s identity secret and have kept that promise to this day, to avoid her children and grandchildren suffering that shame. The child’s father was sent to the Arctic Front, escaping death by fleeing across a river into Sweden. However, the Swedish authorities allowed him to be extradited to the USSR when the war ended. He was only released in 1956. The child’s mother moved to Oslo where she moved in with a Norwegian man to create a new family and prevent the child being taken off her and sent to Germany [sending the offspring of German soldiers back to Germany was a policy of the post-war Norwegian government]. ‘The stories from this time are ugly,” says Edmund Eide. “The guys from the UK and the woods [Norwegian forces mostly from Scotland or the south who were sent to Kirkenes to re-establish control over the areas liberated by the Red Army] came and went as they pleased. I’ve even heard stories about a woman who was raped in front of her two year old as a reprisal for having children with a German. “There were huge numbers of soldiers passing through this region, 50,000 or more, many more than the local population. Austria was annexed by the Nazis and the soldiers were forced into the war. They were as fed up as we were. Our family celebrated Christmas in 1941, ’42 and ’43 with Austrian soldiers. They were young men, the Austrians, and received packages from home, so could offer much that Norwegians could not. Also because of AS Varanger [the iron ore mining company] there were many immigrants in Sør-Varanger. The newspaper carries a second article, also written by Birgitte Wisur Olsen headlined ‘How is it possible to put a lid on this story?’ exploring the issues that lie behind the decision to keep the child secret. 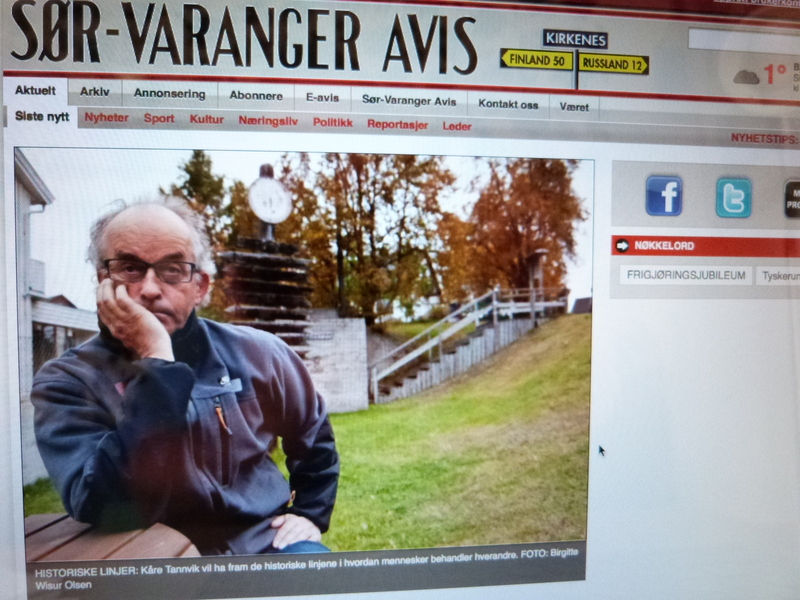 The story of the secret love-child from the tunnel has been taken up by Kirkenes-based film producer Kåre Tannvik who runs the tourist magnet ‘Snow Hotel’ and opened up the Andersgrotta bomb shelter where many townspeople sheltered during the war. Kåre has organised a seminar called ‘The story of the 11th Child’ to explore the post-war treatment of wartime love children. “I will try to bring out the historical lines of how people treat each other [in Norway]” he tells the newspaper. “First it was German kids, or ‘love kids’, as I choose to call them. Then it was the Communist kids. Who will be the next to be trampled on? Muslim kids? What does this say about how we are as people? Kåre Tannvik was the star of the war films ‘Scorched Earth’ and ‘Under A Rock Sky’ where the entire tunnel at Bjornevatn including the nursery was reconstructed at Lenfilm Studios in St. Petersburg. He has been involved in various projects to remember the war and tell stories from it since he was 15 years old, and he wonders now if this is the final twist in the story of the 11th child. “Why has this story not been told before,” he says. “Why now? Why in a small piece in the Sør-Varanger Avis? “The stamp of prejudice is perpetual – for generations. It’s become like a birthmark. 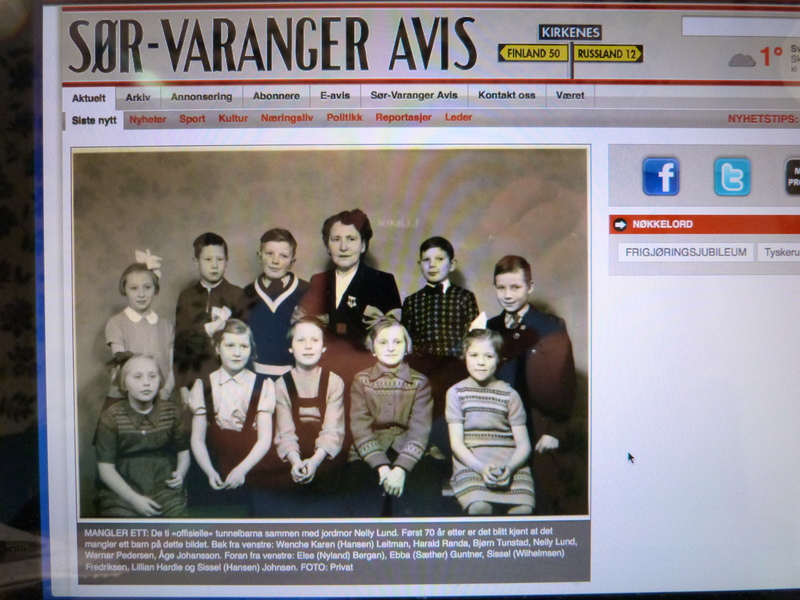 The official records show there were 220 German ‘love kids’ born and 50 Russian children in Sør-Varanger. “Still, there is a network of women from South Varanger, aged 70 to 74 years, which has taken to talking. For the war is not forgotten. Memories never die. Many ladies have powerful memories from the war,” says Kåre. Having met Kåre Tannvik, if only briefly, I know that he is a man who is committed to the search for the truth, and he will pursue it however long that process takes. He stepped in to re-open the Andersgrotta when it was abandoned by the Civil Defence in the late 1980s and opened it up as a tourist attraction in 1992. Now more than 70,000 tourists have visited the manmade cave, myself included. Kåre believes Norway – and the wider world – has a one-sided view of what happened during the war, and that there is more to the story than the Resistance heroes in the south. In particular he is keen for the real story to be told about what happened when the Norwegian soldiers from the UK and the south moved in to re-establish control following the liberation, the so-called 2 Bergkompani, which included among their number the ethnographer and adventurer Thor Heyerdahl, later feted for his crossing of the Pacific on the raft Kon-Tiki. “People are shocked by what they see and hear when they come here,” says Tannvik. “They think the war is about Max Manus [the Resistance leader] whereas it’s my view that in the south only the Rjukan campaign [the sabotage of the heavy water plant at Telemark that prevented the Nazis developing the atom bomb] that had any significance. Otherwise it was Narvik and Kirkenes that were the important places. Kåre says he hopes to have multiple seminars in Kirkenes now the 70th anniversary has been marked. “Meetings where people can come and listen, share their experiences and have conversations,” he says. “Not just about the 11th Tunnel Baby, but about the Communist kids, and the behaviour of the 2 Bergkompani. You can read more about this period of Norwegian wartime history in my book ‘Fire and Ice: the Nazis’ scorched earth campaign in Norway’ published by The History Press. This is a collection of personal accounts told by people in Kirkenes about what happened there during the occupation and the liberation. Kåre Tannvik is one of the contributors. This entry was posted in 20th century history, Arctic Circle, Finnmark, Fire and Ice, Germany, Hitler, Liberation, Nazi, Norway, Scorched Earth, Soviet Union and tagged Bergkompani, dark secrets, Fire and Ice, Liberation, love child, Nazi Germany, Norway Oslo Kirkenes Hammerfest Wideroe Radisson R. Bookmark the permalink.